A week on from the Snowdonia Marathon and my recovery is going well. Sunday, Monday and Tuesday were rest days, the blister that I had gotten on the Marathon limited the amount of movement I could do so most of it was spent hobbling around. Wednesday, Thursday and Friday was active recovery (more through necessity than choice) with cycling to and from work. I think getting my legs working again sooner rather than later has helped me a great deal and Saturday was a really good 5.6 mile run at a pace that I was pretty pleased with. With the Grim Original 2012 only a few weeks away it was good to get out and do a faster paced run focusing on a shorter distance. I ran with another guy who is doing the race (Kev) and despite the constant uphill our competitiveness meant that although we both wanted to walk on the steeper sections, we didn’t. 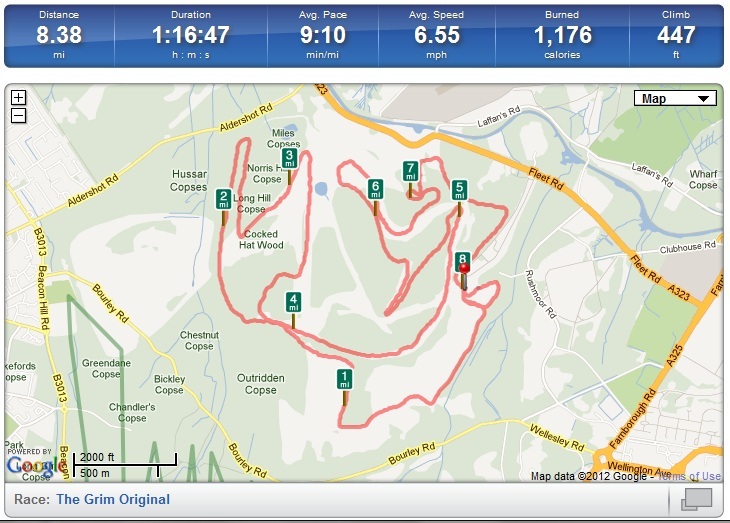 The Grim in 2011 had 136 meters of climb over about 8.38 miles (according to Garmin) and yesterday was 222 meters so in terms of hill fitness I am pretty confident that weather permitting I should beat my 01:16:47 of last year. GRIM is held over the Army’s vehicle testing tracks so expect it to be interesting! It’s tough but we know you wouldn’t want it any other way and 6,500 nutters in 2011 are proof of that. Either enter as an individual or round up some mates and enter as a team of three people in either the women only, men only or mixed team categories. There are prizes for the top 5 individuals and top three teams. Entries close when we sell out – and we will so don’t delay. For some filthy fun, enter now – £30 includes survivors race t-shirt. We’re sure you are tough enough – see you on the start line! As of writing it seems there are still places available for the Saturday (1st) and Sunday (2nd) December so if you like a challenge, great atmosphere and are not afraid of getting muddy this could be the race for you. In cycling news, it’s getting pretty cold out there and despite having a windproof jacket and trousers, one part of my body is getting very cold, my toes. Despite wearing a sock liner and waterproof seal skin socks I get to work and my toes are numb. 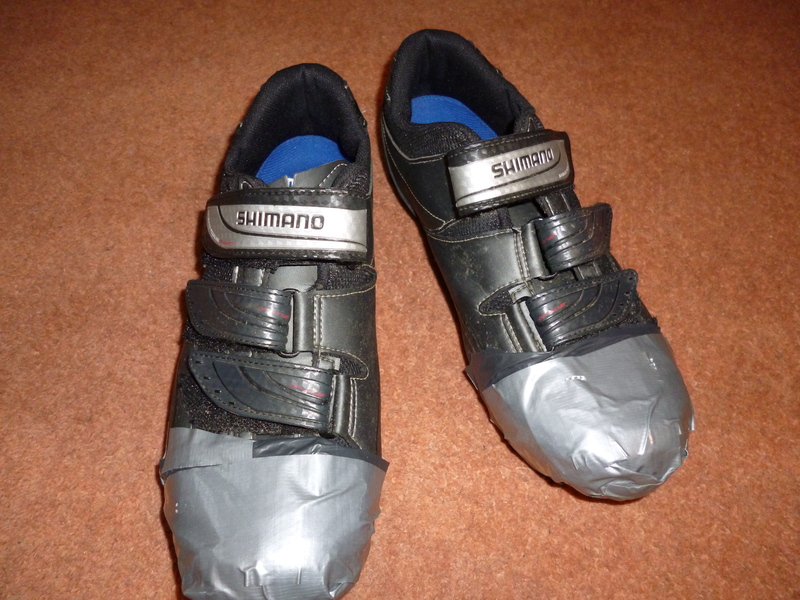 With this in mind and not wanting to spend more money on cycling kit (not when it can be redirected to running kit :-)) I have gotten creative and fashioned some windproof toe caps. It’s amazing what you can do with a bit of duct tape and a bin liner! Fingers (and toes) crossed this keeps out the pesky wind and keeps my toes toasty.